Update: In light of yesterday’s train wreck, I am currently re-evaluating my position on the D-Trains. Our second day in Anyang, we spent some time touring some of the local cultural sites. We first went to the site of Yin Ruins, which are the site of one of the capitals of the Shang Dynasty. The Shang Dynasty is reputed to be the second dynasty (following the Xia Dynasty) in Chinese history, and the oldest dynasty known to exist (the existence of the Xia Dynasty cannot be historically confirmed). In addition to touring the grounds, we also visited the on-site museum which some of the Shell and Bone “manuscripts” (in addition to other artifacts). 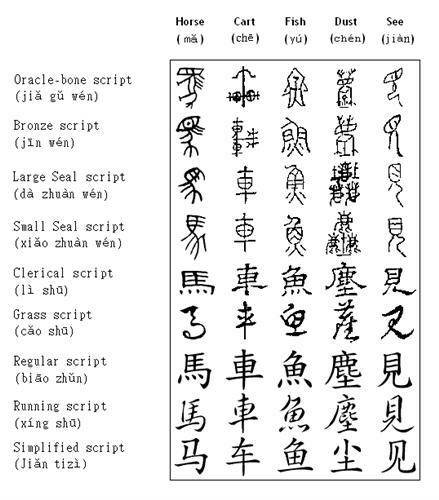 The Shell and Bone script was frequently carved on the “belly shells” of turtles, and if you look closely in the pictures above, you can see some of the carvings on the shells. The writing is quite small and doesn’t bear a whole lot of resemble to modern character styles, but it’s pretty neat to look at. You can see the evolution of a few characters in this chart. Next we went to lunch. But on the way, our bus broke down (in the middle of traffic). It was slightly disconcerting being stranded on the side of busy thoroughfare, but after about 30 minutes or so one of our group’s other buses (we had three) came and took us to lunch. I was quite surprised when, after lunch, the formerly broken-down/stranded bus was parked in the restaurant’s parking lot. Apparently, it doesn’t take Chinese mechanics two or three days to fix an engine problem. After lunch, we went to the Chenghuang Temple to watch a Yang Ge performance. It was something between drum performance and a dance, with the performers all decked out in red, beating on drums and, moving about in a fairly complex fashion. The temple also had some different types of artwork on display (and a few Buddhist shrines), so wandered around those for a bit. The temples had rather graphic visual depictions of hell, which were both intriguing and disturbing. It was a little graphic for my taste, with demons ripping people to pieces and spewing blood everywhere. It wasn’t exactly family friendly. Finally, we went to go see the Wenfeng Pagoda, which was some sort of ancient Buddhist temple, or something along those lines. There were also two (apparently active) shrines next to the Pagoda. I snapped a few pictures of the statues, but there were people praying and whatnot in the temples, so I tried to tone-down my touristy side. After wandering about the city for a bit (and a rather tasty dinner- we had, among other things, a blue soup made with laver? ), we took the train back to Beijing. Except this time, we took a D-train, which is one of the slower bullet-trains that people are always salivating over. It was much nicer than the T-train. It still took about 4 hours to get to Beijing, but there were no people in the aisles, I had plenty of leg-room, the AC worked, it was clean, and I had a nice soft seat. It was a bit more expensive than the T-train (a ticket was 155 yuan, or about $24), but in my opinion, it was well worth the extra $10. I could comfortably ride a D-train again, while nothing short of a gun to my head would get me on a T-train. To get to and from Anyang we used China’s famed train system. Going into Anyang, we took one of the T-class trains, which is a sort of mid-level, moderately fast train. It took about 5.5 hours and cost something in the neighborhood of $10 to ride. Apparently, when they sell tickets for the train, they sell tickets for individual seats as well as tickets for the empty space in the middle aisle. So, what you end up with is a very packed train car, with all of the seats filled and lots of people crammed (usually standing) into the aisle. There was even one guy sleeping underneath my seat. Aside from the discomfort that results from being crammed into a train car like a bunch of sardines, this makes it very difficult to navigate the car. So, every time the food cart goes down the train or someone needs to use the bathroom, there’s a rather frequent, uncomfortable shifting that takes place. It was probably as close to hell as I’ve ever been, and I could probably die happy if I never have to do that again. Though, from what I understand, during the Chinese New Year, when all of the urban workers return to their home villages, the T-trains are twice as packed (there’s actually a fairly decent movie-with English subtitles- about this, Last Train Home). I think I’d rather die. However, the living hell that was our train ride down was partially offset by our accommodations for the weekend at the Anyang Hotel. It has a four-star rating, but that’s relative to the other hotels in the area. It was still quite nice, though. On the level of a nice Holiday Inn or Best Western (though with considerably more marble). Peach Blossom Gorge is very easy to hike. Actually, it can barely be called hiking, and is more like walking around a beautiful garden along a paved road. While the area was quite pretty, the hike was a little more involved than we were led to believe. We actually ended up hiking up part of a mountain, along a rather adventurous trail. While fairly tiring, it was quite enjoyable. About halfway up, there were a couple of people selling cucumbers, which apparently you eat whole. I kind of felt like a rabbit, munching on my cucumber, but it was quite tasty. At the end of our first hike, we stopped for lunch at a local restaurant. It was a typical communal-style Chinese meal, but one of the dishes was carp. I’m not entirely sure how they cooked it, but the fish was left whole and intact when it was placed on our table. The fact that it was right in front of me didn’t really help either, as I couldn’t really bring myself to eat it with it sitting there smiling at me. After lunch, we hiked up Wang Xiangyan Mountain, the “difficult” hike. This hike was quite arduous, as it involved walking up the side of a very tall mountain. There were a few flat spots, but the trail was very vertical. At one point (there’s a picture above), we had to climb up this tall, green tower with a winding staircase in order to continue up the mountain. However, at the top, the views were quite nice. It was a little cloudy, which was a little unfortunate, but it was otherwise quite nice. There was even a little shrine at the top, which a couple of monks kept trying to persuade us to enter (with an accompanying donation of course). Once we hiked down, we were pretty much done for the day, being too tired to do much of anything else. In the interest of keeping this post of reasonable length, I’ll post the photos and whatnot of our second day in another post.